If you want an affordable synthetic alternative to the fabled Winsor and Newton Series 7, look no further. Use it on testors enamels as acrylic paint brushes or oil painting brushes. They make the best watercolor brushes for tiny artwork on canvas as a detailing paint brush set. 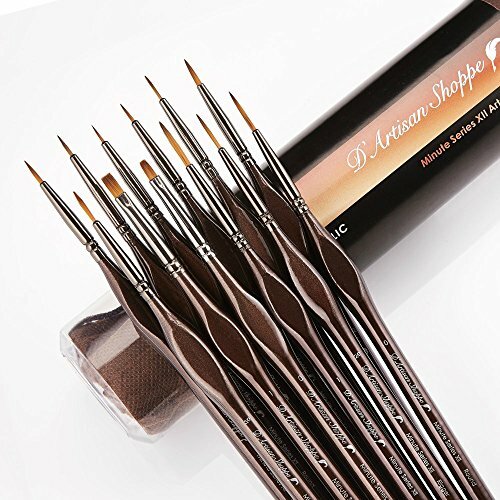 DETAIL PAINT BRUSHES - Fine tipped miniature brushes allows you to do fine detail painting precisely to reach tight, small spots and tiny points such as wildlife, botanical, portraiture, doll, illustrations, model car, ships and airplanes, or micro detailing fantasy figurines.